History of English Football, British Sport History! England can’t really lay claim to having invented the game of football, people the world over had been squaring up to each other to push something vaguely ball-shaped in a given direction for a very long time. Playing football of a type is recorded in China over 5,000 years ago. In England the game, or something like it is at least hundreds of years old. 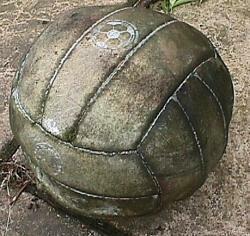 Packs from one village have competed with a rival village to push a ball several miles to a goal, usually sited conveniently near an ale house in each village. Such was the attraction to the game by the common people that it was very often banned in English history, often because Kings wanted their men to be honing fighting skills instead playing ball. Bishops, meanwhile, desired men to be more pious and less inclined to playing what was seen as a foul game of violence and ill repute. In England during the second half of the 19th century a rough game involving two teams and an odd shaped ball started to evolve into soccer. During this period football distanced itself from its shared roots with rugby football and formed a distinct identity as soccer. The first ‘official’ rules of the game were laid down by various clubs and associations during this era of change. It was the rules chosen by the Football Association, which first formed in 1863, that prevailed. The FA rules have changed several times from those first drafts in 1863 to become those now universally recognised as the rules of the game. History would suggest the process is ongoing. Professionalism came to soccer as early as 1885, although players could only expect a wage of around one pound per week, rather less than today’s fabulous fees. The emphasis gradually moved away from the rugby style of making contact with ball and hand. The goalkeeper was soon the only player allowed to handle the ball infield and by the First World War he was only allowed to do this back within his own penalty area. This change of the role of the goalie in 1912 was perhaps the last of the major changes to the rules. Once he had been effectively confined to the penalty area the real art of attacking football could be properly developed. Shoulder barging the goalie over the line with the ball for a goal, pushing and shoving players on or off the ball, were all part of the Victorian and Edwardian game. Much of the overtly physical play was still part of football into the start of the 20th century. When this type of physical play was outlawed the game changed beyond recognition. The FA grew rapidly in the 20th century and players and clubs rose up on the back of this tide of popularity. By the turn of the century there were already two divisions, Division One and Division Two. At this point moving up or down a league was still not done entirely on merit. Arsenal were elected into Division One just after the First World War despite finishing fifth in Division Two in the 1914 season, the final one played before the war. Arsenal have been in the top flight ever since! A third division was added, formed from the old Southern League clubs, in 1920. The Football League was suspended during both World Wars. Portsmouth won the last FA cup final played prior to WWII . This means they are still the club to have retained the FA cup for the longest continuous run of years, despite only having won two finals in the club’s long history! 1958 saw the addition of Division Four and the scrapping of the old regional lower divisions. This move finally introduced the structure that is the basis for today’s league of four principle divisions. During the 1960 and 1970s the game developed with footballers like George Best emerging on the pitch as celebrities. They were also being seen off the pitch with pop groups and film stars. The English game survived some difficult periods when it was plagued with violence both at home and abroad, the trouble coming to football in the 1970s. Difficult times for the economy and large scale unemployment also pushed football to the brink at times but the game’s popularity and resilience always ensured its survival. The 1981/82 season saw the most dramatic rule change for some while with the switch from two points to three points for a win. This was done in the hope of stimulating attacking play and to reduce the number of no-score draws, which had reached a peak during the Seventies. A system of play-offs to help decide promotion and relegation between the various leagues is now in place, having first been tried in 86/87 season. In the nineties the divisions were renamed in an attempt to place further emphasis on the top tier. The clubs which would have remained in the first division for the 1992/93 season instead formed the newly formed ‘super league’ called the F.A. Premier League. The remaining divisions two, three and four of the Football League were subsequently renamed as Divisions One, Two and Three. Football’s popularity inevitably meant the rise of money as the most important factor in all aspects of the game. Money has become a vital part of a team’s success in an almost self-serving circle. Without money a team can’t have the depth and quality in their squad to win the league and survive gruelling campaigns in Europe. Without the depth and quality of squad they can’t win enough trophies to make big money. Good players demand astronomical fees and film-star wage packets. Long gone are the days when, in 1905, the football public were shocked by the first ever £1000 transfer fee paid for Alf Common during his move to Middlesbrough . There was even an attempt by the FA to limit the spiralling transfer market in 1908, when the transfer fee was set at a maximum of only £350 per player in January. The unpopular rule was short lived and was withdrawn in April the same year. The first £10,000 transfer came in 1928 and, just over fifty years later, in February 1979 Trevor Francis was sold by Birmingham City to Brian Clough ’s Nottingham Forest for one million pounds. The first televised football match was aired by the BBC when they screened a friendly match between Arsenal and Arsenal Reserves at Highbury on 16 September 1937. The match had been arranged especially for broadcast. The first televised international match was England versus Scotland on 9 April 1938. The FA Cup final had a TV debut on 30 April 1938 when Huddersfield Town played Preston North End . For the 1960-61 season the ITV agreed a £150,000 deal with the Football League to screen 26 live matches. The very first live league match was shown on Saturday September 10, 1960. The game featured was between Blackpool and Bolton Wanderers and was filmed at Bloomfield Road. The FA were historically worried that too much exposure for games in the living room would wreck attendances at grounds. With the growth of satellite and cable services the FA was forced to move with the times. They had to bow to popular pressure and plain economics and try to develop a strategy that could exploit the income TV could generate. The Premier League has always maintained close links with television and networks have fought bitterly over the various football rights on offer. Four big teams have emerged as top dogs in the Premier League, setting such a high standard that other clubs struggle to compete. Arsenal, Chelsea , Liverpool and Manchester United have taken a firm hold of the top of the Premiership, building on many years of being some of the strongest teams in English football. Manchester United had formed a formidable team in late 1950s with league title wins in 1956 and ‘57. The run ended in terrible tragedy on Thursday 6 February, 1958 when 23 people connected with the Manchester United team were killed in the Munich Air Disaster. Eight Manchester United players from the team, nicknamed the Busby Babes after the enigmatic manager Matt Busby , died in the crash. Busby himself was severely injured but survived after two months in hospital. The plucky Scot rebuilt himself and the Manchester United team, and they went on to win the league title together again during the Sixties. Arsenal are one of the two London clubs making up the big four. Like their London rivals Chelsea, they are a club with a passionate following and a rich history. Arsenal F.C. was first formed in 1886 by the workers of the Royal Arsenal in Woolwich and has been one of England’s most successful football clubs in both the league and the FA cup terms. Rival team Chelsea may be the slightly newer club but they can still boast more than 100 years playing football, having been founded back in 1905. The team had many spells of success in the past, with a league title in 1955 and several cup wins during the 60s and 70s. But since the year 2000 Chelsea have enjoyed their best the success and got themselves firmly in the limelight both at home and in Europe. Liverpool F.C. is another club with more than one hundred years to look back on. The club formed in 1892 and has a bulging trophy cabinet that they haven’t stopped adding to. Liverpool have won multiple league titles, FA cups and European titles throughout their rich history. Liverpool’s success has overshadowed the efforts of their neighbours at Everton . There was a time in football when the players turned out for a game wearing an outfit looking suspiciously like a poorly dyed set of cowboy’s thermals and some old miner’s boots. As the game developed so did the kit and inevitably fans started paying closer attention to what their heroes were wearing. In the modern game football boots are a statement in science and fashion and team kits seem to change faster than traffic lights. A look along the terraces at any game at any club will reveal scores of fans wearing their replica shirts in an outward show of allegiance. Even at clubs that haven’t yet managed to get a hold in the top four, like Wigan or Aston Villa , West Ham or Tottenham the history and therefore the fan base is so strong and it’s prepared to spend money to show that loyalty. The internet has allowed clubs another outlet for reaching out to their burgeoning international fan base. Not one single premiership football club is without a website, quite a far cry from the past when match programs were about the only way a club would communicate with the public. It isn’t just players like Sir Stanley Matthews or David Beckham who have been propelled to stardom by the game, today’s managers are also thrust into the limelight. Sir Alex Ferguson has enjoyed a long reign at Manchester United and his success there has made him a household name. Born in Glasgow, Sir Alex has won more trophies than any other manager of any English club in the entire history of the FA. Even before Ferguson’s time managers could achieve lasting fame and enjoy the affection of the nation. When Sir Alf Ramsey guided England to victory in the World Cup at Wembley in 1966, he ensured his name would always be associated the national game. Management at both club and national level has recently proved to be rather a hot seat with great demands and pressure, often media generated, directed at the managers. Football has continued to evolve in the 21st Century and is now governed not only by the FA but also by the international body FIFA. Changes occasionally still take place in the rules of game as it continues to evolve. What was once an ugly spectacle featuring scores of men fighting in mud over a misshapen leather ball has grown up and become known as the beautiful game.